There is no right or wrong when it comes to colors of shoes being paired with suits, what matters is what looks good and what doesn’t. 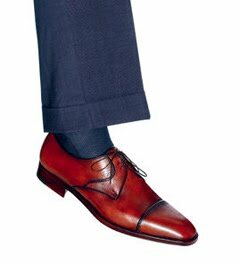 I have seen so many so called ‘Style Advisers’ tell people “You can’t wear tan shoes with navy suits or black shoes with brown suits etc.” but yet have seen so many people wear these combos so gracefully and well done that it just goes to show that these rules should be thrown out the window. I really think that everything just plays to your personality and your ability to pair things that go well together and the confidence to pull them off. Take for example this gentleman on the right. His pairing of medium brown shoes with a navy suit lends a beautiful contrast to the eye that in my opinion could never be done by pairing a solid black shoe with a navy suit. 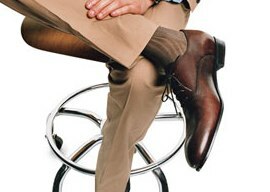 Yet time again, you have so many individuals that say you should never put a navy suit with a light colored brown shoe. These gentlemen who make these remarks usually tend to be older than 40 hence their minds only thinking in terms of what they saw growing up. To their unknowing, times have changed and it is acceptable and, in my mind, more appreciative and elegant to pair a navy suit with any other color but black which will usually make your outfit stand out quite more than the boring monotone assembly of dark colors with dark colors. Of course to argue the contrary, it is usually considered more professional to wear black shoes since they have been branded in our minds as being more elegant in a business like situation. However, this statement also depends upon where you live, America vs. England vs. France vs. Italy, and also what profession you are in e.g. the arts, fashion, retail, finance, banking etc. Gray Suits: Same things as navy, the possibilities are pretty much endless (depending on the shade of suit). Lighter grays for me, are a bit more versatile, where as charcoal suits head towards the territory of black. All in all, I have no rules, I generally tend to wear what I feel like. However sometimes I feel like an anomaly, especially in America, and what I believe the average man would be comfortable wearing is: black suits with black shoes; navy suits with either black, any shade of brown or burgundy/oxblood/cordovan colored shoes; and gray suits with the same colors as a navy suit. However, with gray suits there are different shades and for me the more contrast you create the more catching and appreciative the outfit. Here are several other pictures to show the different looks in pairing suits with shoes. Good point of view and great examples! 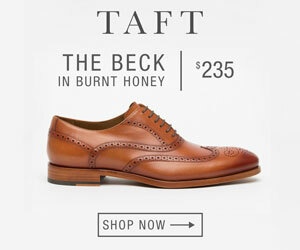 Justin FitzPatrick, "The Shoe Snob"
Ahem…Let's not assume that all the over 40S folks are stuck in the traditional way of looking at things….That navy and brown combo is HOT! I really enjoyed this knowledgeable article,thank you Justin……. "you have so many individuals that say you should never put a navy suit with a light colored brown shoe…their minds only thinking in terms of what they saw growing up. To their unknowing, times have changed and it is acceptable…. "You are mistaken. Times have not changed; light brown shoes with a navy suit have always been acceptable. As you say, it's merely a question of whether the wearer can pull off the look. Such people didn't appear suddenly twenty years ago. They have always existed. What color of suit/pants should I wear with navy shoes? Should it be gray suit/pants? I have been given a pair of these Jeffery West aubergine coloured shoes -http://www.jeffery-west.co.uk/jefferywest/product.asp?item=moon-punch-front-gibson-29-230#.UNx50qVFFJ8What colour suits can I wear them with? Thanks Justin, great site you have here. Justin, I appreciated your article. Keep up the great work!! The key is being true to one's self/style. Too often, so many allow themselves to be bound by antiquated dress codes. Being an older gent of 54, I don't always conform to fashion's dictates, as I believe if it feels & looks good on you, go for it. 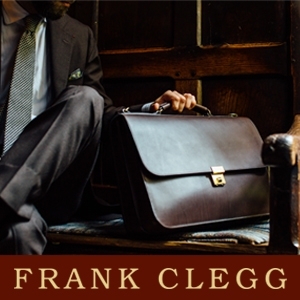 Having traveled extensively during my military career, only further encouraged my "clotheshorse" attitude.Regarding my black and grey/charcoal suits, moreso pinstripes, I like to wear cognac wingtips with complimenting shades accessorized by ties, shirts and/or cufflinks thrown in. I like the sublte contrast of colors. what color shoes would go best with them besides black and burgundy? I’m wearing a silver suit(it’s got some shine but not to much) to a red carpet event. What are good options for shoe color? I am about to graduate from university and I’m afraid I don’t have much when it comes to fashion sense. 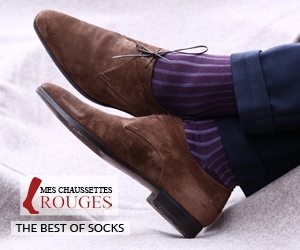 I found these Fluevogs, and I thought that between the two different shades, burgundy and blue, they could work with just about any shade of suit I could buy. Would you agree with this assessment? Dear Chris, if you want my honest opinion, the boots themselves would not go with any suit. I am sorry but would rather be honest than lie to you. Just got those dark navy shoes. Can I wear a navy suit with or should I put in a grey one? In both of the examples shown,the suit does not appear to fit well. The choice of shoe and it’s color seem secondary to the look of the suit. I just bought dark gray shoes to wear with a black suit. I would like to wear a white shirt and was thinking about options of ties. A lighter silk gray tie, a flower bright pattern tie, a plain tie, a purple and grey pattern tie and a red tie. Please suggest. Getting hitched in May. Fellas are wearing light grey suits. The ladies in mint green dresses. Most likely our ties will be mint as well. Thoughts on a medium cognac shoe/belt? Maybe some funky mint grey/grey socks? 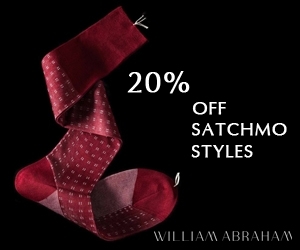 Suggestions for sock shopping? I’d suggest against matching ties. You’ll end up looking like a prom. Instead try coordinating colors like a dark green tie, deep green or so. For the shoes, I’d wear a black or burgundy shoe. You can have more fun with socks with a bright green or lime green. It’s a funky and fun green coordination. It’ll look classy, expensive and fun. Best of luck! Hey Justin – Big fan of our products! 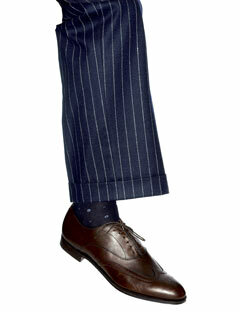 I just bought myself a pair of Barkers in Cedar Calf – What colour suit do you think they will work best with? I would say, mid blue or light grey would be best…stay away from anything too dark…..
Do you know who says light tan shoes DONT go with dark suits? Bausch and Lomb!!!! What’s up with these NFL guys on sports shows wearing this hideous combo???? I am not Justin, but absolutely yes. I hope you did not wear tan/brown shoes with a black suit to your function. I’d like advice on pairing a pair of grey oxfords with a dark-blue pinstripe suit. I think they look good together, but I’m not sure how to proceed with the shirt, tie and belt. It’s for a semi-formal xmas party.. Any help would greatly be appreciated. Can you wear burgundy suede shoes with a black suit with pink shirt? Greetings, how about a dark purple slim fitting suit, best shoe color choice?